The Miller No. 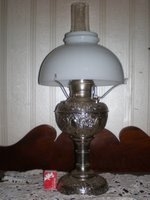 2 table lamps was one of Miller’s ‘stock’ lines. 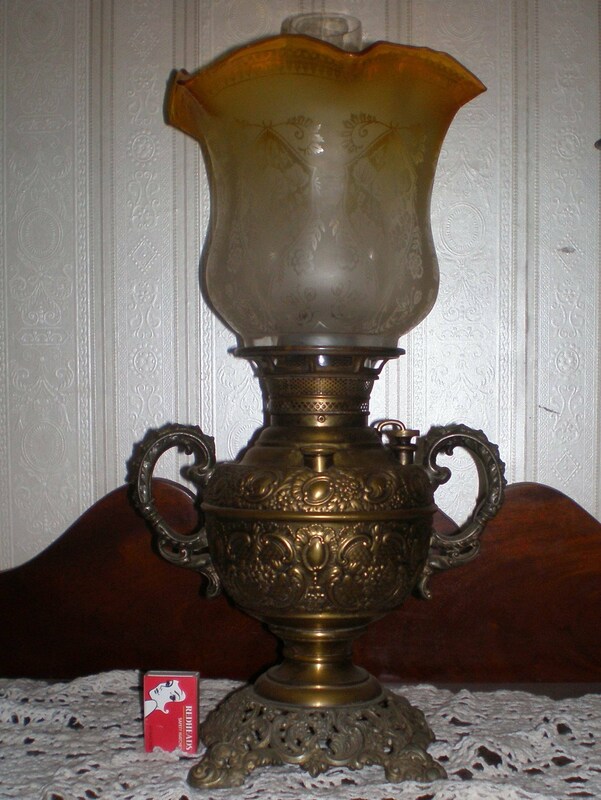 It is this size of lamp, often brass with no decoration that is the most common Miller lamp seen today. This size of lamp was probably the most prolifically produced by Miller given its usefulness, size, economy and light output and exists right across the era of Miller lamps. This particular lamp alone could make its own display as I know of more than a dozen different styles and versions. This lamp, as the name suggests, is fitted with the standard Miller No.2 sized burner. This is a well proportioned burner that gives excellent light output and is economical on kerosene. Table lamps have a low centre of gravity ensure stability. This lamp is nearly always fitted with a tripod and 10” Miller dome shade allowing for maximum light output while still shielding the eyes from the relatively harsh flame. The font holds 2 3/4 pints (1.3 ltrs) of kerosene, is rated to 60 candlepower and burns for seven to eight hours. Stored in family rooms on sideboards these lamps would be placed on the table either at meal times or when the table was being used for work or play or left on the sideboard/cupboard as general lighting. A ‘best quality’ one might find its way to the sideboard in the formal dining room. Fitted with an orginal folding tripod and 10" dome shade it is of a standard table lamp size with the more common embossed brass base. Could also be fitted with a 4" gallery and etched or painted globe shade as can all No. 2 table lamps. 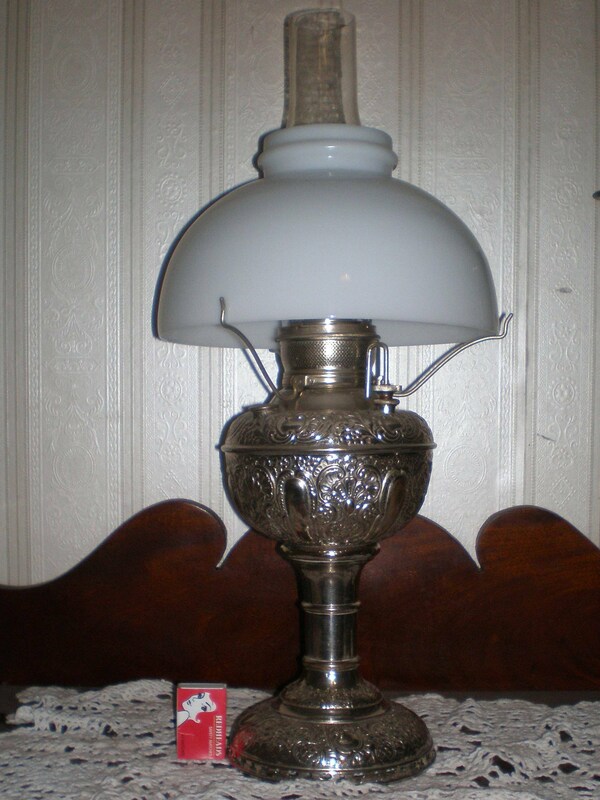 A 'top of the range' lamp of this type. Hieght (to top of burner) 117/8" Circumfrence of fount (at under lip) 191/8"
Fitted with an original folding tripod and plain 10" dome shade - this lamp varies to the above in the fount design. A slightly elongated fount (without adding to the overall height) has a larger capacity to the more common fount (above) and has a distinctly different embossed pattern. The lamp is made 2" taller by an extra long stem. 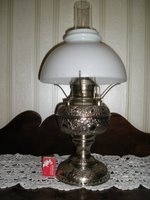 This lamp is not easily comeby, and is known in plain nickel as well as brass (both embossed and plain). Hieght (to top of burner) 137/8" Circumfrence of fount (at under lip) 191/8"
A variation to the standard table lamp was the 'cup' lamp where handles were fitted to ether side of the lamp, causing the lamp to resemble a double handled cup or christening cup. Although the handles can be used to carry the lamp, they were largely for decoration. Various styles of handle are known which a number of types being produced at any one time. Displaying with large elaborate cast handles in spelter, with a matching and equally fine cast spelter base this fully embossed brass cup table lamp is clearly a 'top of the range'. Displayed here with a 4" gallery and reproduction etched open tulip shade. Hieght (to top of burner) 11 1/2" Circumfrence of fount (at under lip) 19"